Climate and weather are natural processes that help shape natural communities . However, severe natural disturbances and climate change may potentially have far-reaching impacts on natural communities of Rock Creek Park. Climate patterns in the Mid-Atlantic region where Rock Creek Park is located have been consistent for the past few thousand years—but these patterns are now beginning to change. According to reports from the Climate Preparedness Program of the Metropolitan Washington Council of Governments, the following recently observed trends in the National Capital Region are expected to continue. Rock Creek at flood stage. Sea level rise combined with local land subsidence and storm surges. Warmer temperatures could lead to the extirpation (local extinction) of some animals and plants for which Rock Creek Park is already the southern end of their range. Warmer temperatures could also make the climate more hospitable to non-native invasive species of plants, vertebrate animals, invertebrates including insects, and microbial pathogens such as bacteria, viruses, and fungi. Warmer nights and fewer freezing days could interfere with the natural signals and requirements of many plants and animals, affecting everything from fruit-setting abilities to overwintering of insects. A change to fewer precipitation events could prove difficult for some plants. A species that needs relatively frequent rains might not survive the dry stretches between rainy days—even if the total annual precipitation remained unchanged. 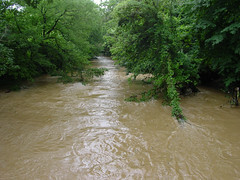 Heavy precipitation events already pose many challenges to Rock Creek Park as a result of its urban location. An increase in heavy precipitation events would bring more of those same challenges. For more information on stormwater runoff, see Current Water and Land Use. In addition to affecting individual species, climate changes could throw off the interactions among species. For example, certain plant species bloom just when migrating hummingbirds arrive. The plants depend on hummingbirds for pollination and the hummingbirds depend on the plants for food. If the plants bloom before hummingbirds arrive, both plants and birds could suffer. Many microbes and invertebrate animals that live in the soil play important roles in natural communities. These creatures depend on a certain amount of soil moisture—different creatures live in dry soil, mesic soil, and wet soil. Even if a plant species could survive the change in precipitation patterns, it could be threatened if a beneficial insect or microbe it depends on could no longer survive in those conditions. Severe natural disturbances such as hurricanes are natural, but they pose challenges to Rock Creek Park, which is a relatively small natural area surrounded by urbanization. 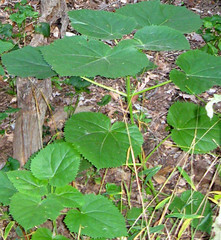 New sunlit openings in forests are an open invitation for the seeds of non-native invasive plants such as princess-tree (Paulownia tomentosa). Although severe natural disturbances are natural, and can be expected to occur from time to time, they may become more frequent with new climate trends. 1. The Nature Conservancy, Sweet Water Trust. 2004. Determining the size of eastern forest reserves.